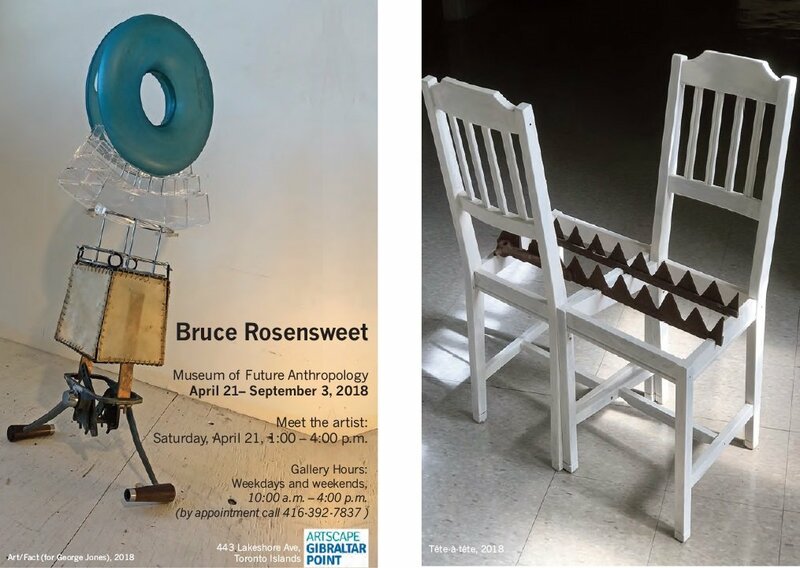 Artscape Gibraltar Point is pleased to announce the opening of Museum of Future Anthropology a new exhibition in our Hallway Gallery, from long-time Artscape Gibraltar Point supporter, islander former Artscape Director of Properties, and “temporary long-term resident”, Bruce Rosensweet. Marking the end of his time here at the centre, Bruce’s exhibition will include new and previously exhibited “artifacts” of a post-apocalyptic future past. While 20th century art history provides numerous sculptors whose work could be seen as the basis for my own, I credit my grandfather, Morse Birndorf with planting the original creative seeds. Moe was an insurance agent working out of his Detroit bungalow home for decades and when he hung it up, he retreated to the basement and started knocking out these 3D fish from rusted cans squashed flat, shaped with tin snips and adorned with old bottle caps and assorted flotsam and jetsam. I found them to be fascinatingly expressive. Artscape Gibraltar Point is accessed easily via Centre Island or Hanlan’s Point ferry docks.